Five years ago, Indian director Deepa Mehta tried to make a film about the exploitation of widows. But she and her film crew were forced to quit after violent protests by Hindu leaders. Now, the spotlight is back on the ill-treatment of India's widows. A new film, by an Indian-American director, tells harrowing tales of sexual and physical abuse. In the fading light of afternoon, nearly 300 women sit chanting on the marble floor, their skeletal faces shrouded in white saris. It is the second shift in Vrindavan's largest widow ashram (religious retreat), some 200 kilometres east of the Indian capital Delhi. Many have been forced to shave their heads. All wear the color of grief, waiting for the day they too will follow their husbands into the afterlife. The women struggle to stay awake. 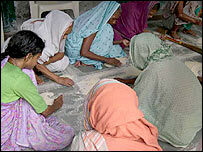 But they must, because a shift here earns them one plate of rice and lentils, just enough to survive. Their story is now being told on-screen. A new film called White Rainbows tells the story of four widows in Vrindavan - who were raped, disfigured and abandoned by their families. 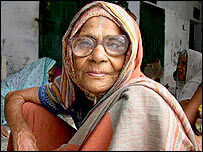 It is based on the real life story of Mohini Giri, today, India's leading advocate of widows' rights. She says the film tells the ugly truth. "The atrocities are manifold - one is due to hunger, the second - no shelter - they have to depend on men who in turn molest them or take advantage of their vulnerability and the third is illiteracy - they are not educated. "Not having these three things leaves them in a dismal state." Dharan Mandrayar, is the film's director. An Indian living in California, he says he was shocked to discover widows were still treated in such appalling manner. "It's unbelievable that families would abandon their mothers...that's why we decided to do this film. "We are hoping that even if it changes a couple of minds to do something or to help we have achieved something." Most widows I talked to said this was their fate. Anita Yadav is 29-years-old. After her husband died of alcohol poisoning, she too fled to Vrindavan with her three young children. "My brother in law kept trying to molest me. He'd come to my room again and again. I complained, but my in-laws took his side. "They said, either marry him, or get out." But Anita has found a rare sanctuary. She lives in a rescue mission run by Mohini Giri who has joined hands with Dharan Mandrayar to spread the film's message. Here, the women wear colorful saris - red and green, white with purple polkadots - to reject the stigma of widowhood. They can pray or simply watch TV. These small freedoms are important. And after the violent opposition to the last film on widows in India, the making of White Rainbows alone is progress.